← Recording Beautiful Things memories. Best Practise. Oh it’s a very cold day here today. This morning was more than usually hard due to a very patchy nights sleep. If it wasn’t Steve coughing and wheezing like some nightmarish germ-ridden steam-punk engine it was Ida who had a series of troubling dreams. Steve even grudgingly agreed to put the heating on which means Ida and I don’t have to hang out round the sewing machine in coats. 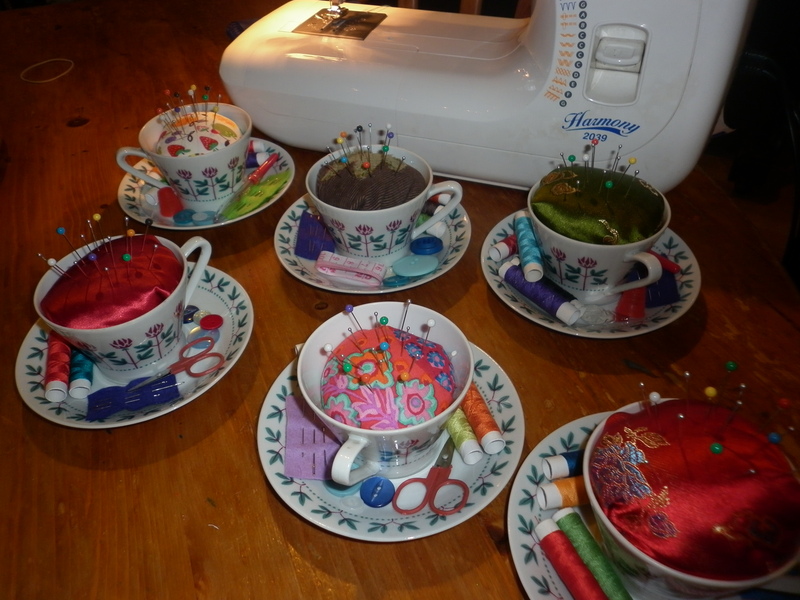 Last night Zeph helped me pack up these teacup pincushions. They’re now wrapped up in cellophane and looking very pretty piled on top of the piano. It helps ease the pain of breaking into my teacup collection. I can’t resist them in charity shops and jumble sales much to Steve’s disapproval. Finally the raggle-taggle collection under the bed has been put to a satisfying use. They’re voting today in Egypt. I think of it hopefully. Thin ends of wedges, small steps on long journeys and all that. It’s my best BT of the day and I send optimism up into the air and blow it their way. This entry was posted in Uncategorized and tagged Beautiful Things, books, cooking, craft, sleep, winter. Bookmark the permalink. Oh I’ve missed you, always find your words so soothing, even germ-ridden steam-punk engine – love that description. Love teacups too, my mum collected them. Great idea, I want to do turn some into candles too.